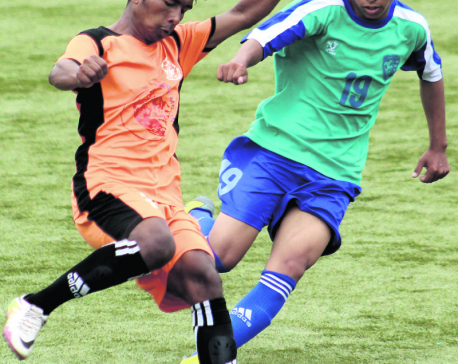 PANCHTHAR, Jan 2: A-Division outfit Himalayan Sherpa Club faced an early exit from the eighth edition of Falgunanda Gold Cup in Phidim, Panchthar on Monday after it faced a 3-0 defeat at the hands of Eleven Arrows Club of Sunsari. In the nine-a-side match, Eleven Arrows took the lead during the half an hour mark through African player Samsing. He collected the ball after Himalayan's defender fell down in his bid to clear the ball. Eleven Arrows added two more goals after the break to stun Himalayan with Samsing adding second goal as well. He netted his second individual goal 23 minutes after the break when he converted Nishan Limbu's cross set by Saujanya Rai. African recruit Peter sealed the victory seven minutes from time in his solo effort taking the ball from the middle of the pitch before unleashing a scorcher from the danger zone. With the victory, winner Eleven Arrows secured a place in the quarterfinals of the tournament.